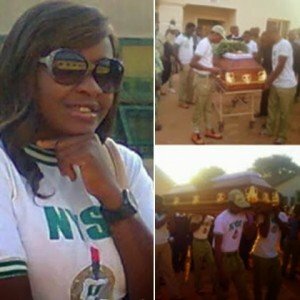 A NYSC corper named Precious Adaeze passed away last Tuesday in a fatal car accident while returning back to Mangu camp in Jos, Plateau state for her youth service. Precious who was said to be a band instructor for her camp met her untimely death when the commercial bus conveying her and other passengers overtook another vehicle leading to a head-on collision. Precious was at her described as a very patient and active lady in camp. Her favourite song ‘Kabiosi’ thrills everyone at Mangu camp anytime she sings it. Precious Adaeze‘s corpse left for her hometown on Tuesday morning and her burial is scheduled for today.